The next Q&A comic is already drawn as I type this, but there's at least one more week to go. If you still have a question, I welcome it. In determining the state of Amanda's clothing throughout this comic, I determined we'd reached the point where they would no longer stay on without assistance, but Amanda wasn't done shrinking yet. It occurred to me that I could buy some time between now and when she's finished (10% size) with the assistance of a safety pin effectively dividing the open space of the shirt's neck hole in half. There are those who are likely to curse that safety pin, but don't blame it. Even if I'd let the shirt fall, she would've been covered up in some other convoluted way. Although I clearly do need more practice with anatomy, particularly with bare legs, but that's what the top secret nudetastic sketchbook I keep locked five feet underground is for. 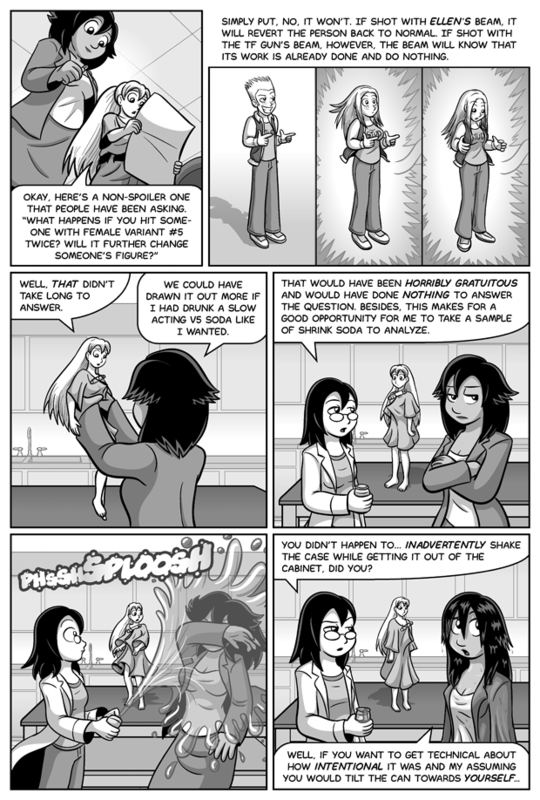 Again for the record, Amanda goes from 50% normal size to 36% normal size during the course of this comic. Lisa is a little under 94% in the last panel, making her briefly the same size as Chika. Chika and Lisa are proportioned the same (head-height wise, anyway), so Lisa looks more natural here than Amanda did when she was equal height to Lisa (Amanda is 6.5 "heads" tall while Lisa and Chika are both 6, so 5' 4" Amanda looks odd next to 5' 4" Lisa).